Nothing much can ever be taken for certain in F1, but one thing that can is that the Canadian Grand Prix never disappoints. What a race! After an immense qualifying session, which saw Nico Rosberg pip his teammate by a few milliseconds to pole, everyone (myself included) was certain we would see another display of Mercedes dominance this Sunday. But it was not to be. Despite starting strong, both Mercedes were afflicted with Power Unit issues, causing a dramatic loss of power around halfway through the race. Hamilton’s power loss was also compounded with a brake failure, which saw him go from chasing for the win to his second retirement of the season. Rosberg struggled with his power for the remainder of the race, but managed to get himself home in second place, gaining valuable points under fire and extending his championship lead. With just three laps to go, Ricciardo had a sudden burst of inspiration, and made a desperate lunge for the lead, flying past the struggling Force India of Sergio Perez, and passing Rosberg in the final chicane of the course, much to the delight of the watching fans. As one of the more popular drivers on the grid, his victory was undoubtedly one the more celebrated ones we have seen. His teammate finished in third place, marking a resurgence for the Red Bull team. In all the turmoil at the end of the race, Jenson Button quietly snuck up out of nowhere and finished in fourth. He passed both Nico Hulkenberg and Fernando Alonso on the penultimate lap of the race, claiming an emphatic fourth place when no one was watching. Kevin Magnusson was not so fortunate, and finished down in ninth place, ahead of Kimi Raikkonen. 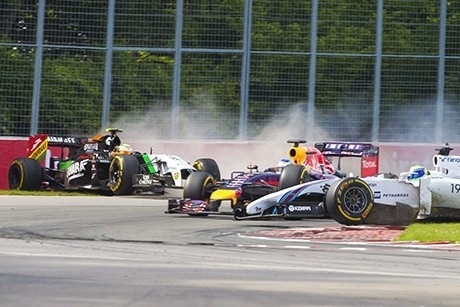 The Canadian Grand Prix was not Ferrari’s race. After a fairly decent showing in the free practice sessions, qualifying was dismal for the team, and the race proved no better. Fernando Alonso had a poor start and was hampered by poor pace throughout the race, with his teammate not fairing any better. The two drivers finished sixth and tenth respectively. The surprise of the day was the Williams team. At one stage, it was even a possibility that Massa would take the lead, and he did in fact lead the race when the two Mercedes were in the pits (the first time this year that someone other than Mercedes has lead a lap). 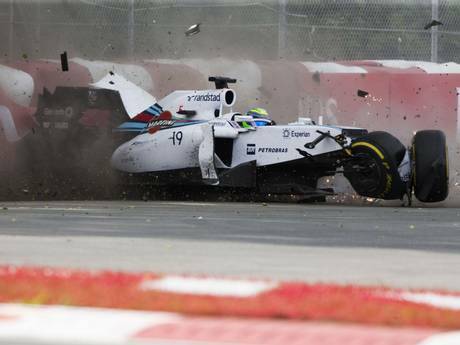 Unfortunately, Bottas failed to deliver on his promise, finishing down in seventh; and Massa was involved in a huge shunt on the last lap of the race with Sergio Perez, which saw both drivers smash into concrete barriers, registering over 27G’s on impact. Both drivers were rushed to hospital for medical checks, and have both been reported as healthy and fine, which is a huge relief for anyone who witnessed the crash. Marussia had a poor day out, with both cars crashing out on the first corner of the first lap. It is Max Chilton’s first ever non-finish of an F1 race after 26 F1 finishes, and something which I’m sure caused the team a lot of heartache after the promise of Monaco where they scored their first points as a team. Lotus had an equally poor day, with Maldonado and Grosjean retiring from the race with separate failures. All in all it was an incredibly exciting race, which showed that some of the teams have managed to improve and capitalize on the failures of Mercedes, but it is still a worrying sign that the power unit on Rosberg’s car had failed, and he was still almost uncatchable. We move to an all new track next race in Austria, and I am looking forward to see what challenges the new environment throws at the teams! Welcome back F1, I missed you.